The two Simons are at it again. Feuding British TV producers Simon Cowell and Simon Fuller are engaged in another legal contretemps, as Fuller is suing Fox Broadcasting over Cowell’s upcoming competition series, The X Factor. In a lawsuit filed in Los Angeles Superior Court, Fuller asserts that Fox has gone back on an earlier agreement to give him an executive producer credit (and the fees associated with the title) on the American version of The X Factor, which was the most sought-after property in this year’s upfront. Fox and Fremantle eventually reached a settlement with Fuller. According to the most recent lawsuit, the two parties agreed to grant him the desired credit in 2005. Another provision of the settlement ensured that Cowell would not launch an American version of The X Factor for at least five years. Pop Idol was exported to these shores in 2002 under the banner American Idol. Cowell served as an Idol judge for nine seasons, before leaving the program last year. Idol was the most expensive advertising showcase on the dial last season, as an average 30-second spot cost $475,000 a pop. Cowell will bring his caustic critical faculties to the set of The X Factor, where he’ll join forces with former Idol co-star Paula Abdul. Also on the judges’ stand are Pussycat Dolls singer Nicole Sherzinger and Epic chairman and CEO L.A. Reid. The original version of The X Factor is a huge hit in England, delivering an average audience of 14.3 million viewers in Season 7. The Dec. 12, 2010, season finale drew 19.4 million viewers, according to the Broadcasters’ Audience Research Board. Fuller sketched out the broad outlines of the suit in a statement released Wednesday. “Mr. Fuller has prudently attempted to settle this matter privately, but the other parties have refused to honor the original contract, leaving him no other choice but to pursue legal action,” a spokesperson for Fuller said. Fox and FremantleMedia returned fire Wednesday, saying Fuller’s case is wholly without merit. While Cowell was not named in Fuller’s suit as such, the animosity between the two men has long been fodder for the gossip columns back home. 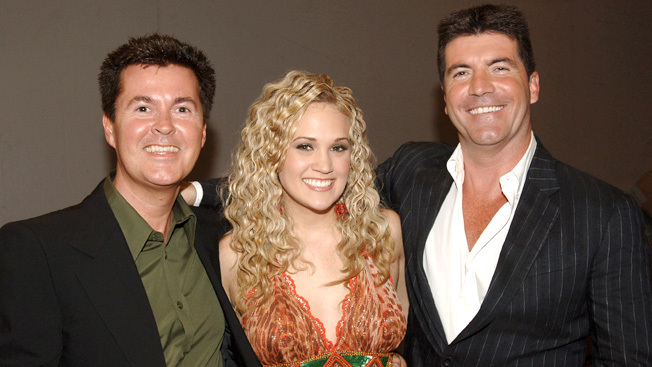 Fuller was said to be furious with his former protégé when Cowell first unveiled his X Factor concept. The Sunday Times estimates Fuller’s net worth at $608 million, while Cowell is believed to be worth $331 million. Fox will introduce American viewers to The X Factor in a special two-night premiere (Sept. 21 and 22).